Size: 5.8" x 3.5" x 1.8"
This boxy calculator followed the EC-100 and doesn't look like a Texas Instruments product. To identify it you should compare it with the Montgomery Ward P800 or the Longines Symphonette Electronic Calculator. If you look deeper into the calculator you'll notice that the EC-200 is very similar to the TI-2500 Datamath but uses an other calculator chip from the TMS0100 series. A later model with serial number A2043934 produced in 1974 uses a TMS0109 calculator chip. 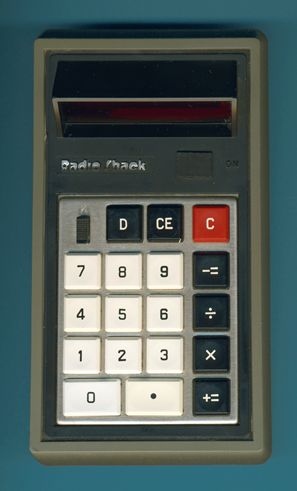 This Radio Shack EC-200 is once again a calculator using the famous Texas Instruments Klixon™ keyboard technology. The battery compartment of the EC-200 sports a small sliding switch to select between "RECHARGABLE NI-CD BATTERIES" and "ALL OTHER BATTERIES". This switch prevents the AC-Adapter from providing a charge to the batteries if the switch is set to "ALL OTHER BATTERIES". With the EC-300 a great change in the design of the calculator happened. Datamath™ and Klixon™ are trademarks of Texas Instruments.